Received: November 6, 2016; Revised: November 24, 2016; Accepted: November 24, 2016.; Published online: December 5, 2016. Doctors are often faced with difficult decisions and uncertainty when patients need a certain treatment. They routinely rely on the scientific literature, in addition to their knowledge, experience, and patient preferences. Clinical practice guidelines are created with the intention of facilitating decision-making. They may offer concise instructions for the diagnosis, management (medical or surgical treatments), and prevention of specific diseases or conditions. All information included in the final version are the result of a systematic review of scientific articles and an assessment of the benefits and costs of alternative care options. The final document attempts to meet the needs of most patients in most circumstances and clinicians, aware of these recommendations, should always make individualized treatment decisions. In this review, we attempted to define the intent and applicability of clinical practice guidelines, expert consensus documents, and registry studies, focusing on the management of patients with thoracic aortic disease. Over the past decade, clinical practice guidelines (CG) have increasingly become a familiar part of medical practice. By creating objective standards, guidelines provide a mechanism to assess physician decision-making and provide a straightforward reference for clinicians. As defined by the Institute of Medicine, guidelines are “statements that include recommendations intended to optimize patient care that are informed by a systematic review of the evidence and an assessment of the benefits and harms of alternative care options” . They may offer concise instructions on which diagnostic or screening tests to order, how and when to provide medical or surgical treatment, how long patients should stay in the hospital, or other details of clinical practice. Clinicians, policymakers, and payers see CG as a tool for making care more consistent and efficient and for closing the gap between what clinicians do and what scientific evidence supports. This article examines the potential benefits and limitations of CG, expert consensus documents (ECDs), and registry studies, focusing on their applicability in the management of patients with thoracic aortic disease (Fig. 1). These are instruments intended to reduce the gap between research and practice and should be based on the best available scientific evidence to improve the quality of patient care. Moreover, CG articulate the consensus of experts interpreting complex data in ways that streamline clinical decisions. However, they are insufficient for medical decision-making . On one hand, decision-making in the absence of CG is vulnerable to cognitive errors on the part of physicians, and many clinical decisions could be better supported by point-of-care decision support tools than by guidelines. Moreover, all medical decisions both trade off certain patient preferences for others, and reflect gaps in medical knowledge. Considering the data resources available in cardiology and cardiac surgery, the degree of uncertainty about these tradeoffs is less than in other fields, but is still present. These decisions are therefore amenable to sophisticated models that present risks, benefits, and uncertainties for the patients in ways that allow them to make tradeoffs. On the other hand, however, CG can contain conflicts and ignore certain tradeoffs, which may confuse providers and patients. Replacing CG with decision models that adequately present the complexity of the decision process would help patients and providers to make better decisions. The following section will outline the process of CG development in order to better understand the complex mechanism through which CG are created. The American College of Cardiology (ACC) and the American Heart Association (AHA) have jointly engaged in the production of guidelines in the area of cardiovascular disease since 1980. More recently, both the Society of Thoracic Surgeons and the American Association for Thoracic Surgery have established working groups and standards. Three principles are fundamentally required for the development of valid and usable guidelines. The first is the creation of a multidisciplinary writing group that accumulates and assesses all relevant published information on a topic. This group makes recommendations as to whether the data support the use or avoidance of a given therapy, basing these recommendations on the strength of the data [3,4]. The second is to identify and assess the evidence [4–6]. This usually necessitates a systematic review to collect all available evidence, assess its potential applicability to the clinical question under consideration, inspect the evidence for susceptibility to bias, and extract and summarize the findings. The third fundamental point is the translation of evidence into CG [4–6]. Opinions are used to interpret evidence and to derive recommendations. When available, information from studies on cost are also considered. The task force makes every effort to avoid potential or perceived conflicts of interest that may arise as a result of industry relationships or personal interests among the writing committee. Currently, CG to provide recommendations for car diovascular disease are created in Northern America by the ACC together with the AHA and in Europe by the European Society of Cardiology with the European Association of Cardiothoracic Surgery. In guideline development, a grading scheme is used based on the level of evidence and class of recommendation. The classification of the level of evidence combines an objective description of the existence and the types of studies supporting the recommendation and expert consensus according to 3 categories (A, B, and C) (Table 1). The class of recommendation designation indicates the strength of a recommendation and it requires by the authors to make a judgment about the relative strengths and weaknesses of the study data and to synthesize conflicting findings among multiple studies . The definitions of the 3 class of recommendation (Table 2) are as follows: (1) class I: conditions for which there is evidence and/or general agreement that a given procedure or treatment is useful and effective; (2) class II: conditions for which there is conflicting evidence and/or a divergence of opinion about the usefulness/efficacy of a procedure or treatment; (3) class IIA: weight of evidence/opinion is in favor of usefulness/efficacy; (4) class IIB: usefulness/efficacy is less well established by evidence/opinion; and (5) class III: conditions for which there is evidence and/or general agreement that the procedure/treatment is not useful/effective and in some cases may be harmful. At the end of the process, all the recommendations require a confidential vote by the writing committee and are approved by the consensus of the voting members. The broad interest in CG has its origin in issues that most healthcare systems face, such as rising healthcare costs due to increased demand for care and more expensive technologies; variations in service delivery among providers and hospitals and the presumption that some of this variation derives from inappropriate care; and, most importantly, the goal of offering the best care possible. Therefore, clinicians, as well as policymakers in the health system, see CG as a tool for making care more consistent and efficient and for closing the gap between what clinicians do and what scientific evidence supports. The principal benefit of CG is to improve the quality of care received by patients. Guidelines that promote interventions proven to be beneficial and discourage ineffective ones have the potential to reduce morbidity and mortality and improve quality of life, at least for some conditions. Clinical guidelines can improve the quality of clinical decisions. They offer explicit recommendations for clinicians who are uncertain about how to proceed, overturn the beliefs of doctors accustomed to outdated practices, improve the consistency of care, and provide authoritative recommendations that reassure practitioners about the appropriateness of their treatment policies . The timing for a specific surgical/medical procedure is another important matter, and CG are also extremely important to identify the correct timing in order to balance the risk and benefit for patients. Moreover, the correct timing of the intervention may also influence the results of the procedure in cardiac surgery and especially in aortic surgery. On one hand, late interventions can increase both intraoperative and postoperative morbidity and mortality, but on the other hand, in early operations or preventive surgery, the risk of the procedure can overwhelm the benefit. Evidence-based guidelines clarify which interventions are of proven benefit and document the quality of the supporting data. They represent an alert for clinicians about interventions that are not supported by adequate scientific data, and reinforce the importance and methods of critical appraisal. Moreover, the implementation of certain CG reduces outlays for hospitalization, prescription drugs, surgery, and other procedures . First, scientific evidence about what to recommend is often lacking, misleading, or misinterpreted. Only a small subset of what is done in medicine has been tested in appropriate, well-designed studies. For example the ACC/AHA CG have progressively increased the number of recommendations over the years (from 1330 to 1973 between 1998 and 2008), but these recommendations largely reflect a lower certainty of evidence . Furthermore, in the current CG, the level of evidence C (indicating recommendations based solely on expert opinion, case studies, or standard of care) is the most frequent designation. The median percentage recommendations supported by evidence of level A is only 11% across current guidelines, indicating little to no objective empirical evidence for most recommended actions . In particular, for valvular heart disease, 70.6% of CG are based on evidence of level C .
Second, recommendations are influenced by the opinions, clinical experience, and composition of the group that develops the CG. The beliefs to which experts subscribe, often in the face of conflicting data, can be based on misconceptions and personal recollections that misrepresent population norms . Third, patients’ needs may not be the only priority in making recommendations. Practices that are suboptimal from the patient’s perspective may be recommended to help control costs, serve societal needs, or protect special interests. Another limitation is the lack on guidelines for newly available treatments or devices. This is the reason why they often need to be revised. Imperfect CG may encourage ineffective, dangerous, or wasteful interventions. Even when CG are correct, clinicians often find them inconvenient and time consuming to use. In addition to guidelines, other tools exist to help clinicians in the decision-making process. ECDs and registries are needed to verify that daily practice corresponds with what is recommended in the CG, thus completing the loop between clinical research, writing of guidelines, disseminating them, and implementing them into clinical practice. ECDs represents the collective opinions of an expert panel on a specific topic relevant for evolving areas of clinical practice and/or technologies that are widely available or new to common practice. Thus, the reader should use an ECD to inform and guide clinical practice in areas where rigorous evidence is still not available or is not widely accepted. When feasible, ECDs include indications or contraindications. Normally, formal recommendations are not provided in ECDs, as these documents do not formally classify the quality of evidence, as usually occurs in the CG. Although consensus statements address topics in which the evidence base is less extensive compared to CG, their development should still be methodologically rigorous and transparent . The task force makes every effort to avoid any actual or potential conflicts of interest that might arise as a result of a personal interest. Specifically, all members of the writing panel are asked to provide disclosure statements of all such relationships that might be perceived as real or potential conflicts of interest. Current examples of areas covered by ECDs in the cardiovascular field include the management of aortic arch disease using the frozen elephant trunk technique and the use of new technologies, such as transcatheter aortic valve implantation or sutureless prosthesis for the aortic valve disease, before CG were available on these topics. Another powerful tool to help clinicians during clinical practice are registry studies. A registry is defined as “an organized system that uses observational study methods to collect uniform data (clinical and other) to evaluate specified outcomes for a population defined by a particular disease, condition or exposure, and that serves one or more predetermined scientific, clinical, or policy purposes” . Registries that enroll patients with a specific disease or who have received a particular treatment are an important source of data for patient-centered outcomes research . The benefits of registries include the measurement of performance criteria, determinations of guideline adherence, estimation of compliance with appropriate use criteria, and the measurement of safety and outcomes . A major advantage of registries is the ability to include the entire spectrum of the patient population with a particular disease, including patients with many comorbidities, who are underrepresented in trials. In other words, they provide data on what we are actually doing in everyday practice. Along with the positive attributes associated with observational registries, they also have shortcomings. Providing all required information is time-consuming, considering that the data are manually extracted and validated by data managers and study coordinators. Another problem is that they frequently may have some missing data, which are difficult or impossible to obtain due to the retrospective nature of registries. Finally, is not possible to maintain the same rigorous methodology that is applied to CGs and ECDs because too much data from many different centers are collected and analyzed over a long period of time. The underreporting of adverse events or missing data is a concern. Although the quality of registry data has been studied, accurate data can only be obtained by careful and meticulous data cleaning and verification . For cardiac surgery, CGs usually provides a rapid response according to the latest high-level clinical evidence, based on thoughtful consideration by leading experts in the field. Thoracic aortic diseases have the particular feature of usually being asymptomatic and not easily detectable until an acute and often catastrophic complication occurs. For this reason, over the last years, there has been growing interest and knowledge concerning the natural history of these pathologies. Moreover, the possibility of using less invasive endovascular procedures along with more accurate imaging technologies has completely revolutionized the therapeutic approach to these conditions. Such considerations have enhanced the complexity of clinical decision-making and stimulated debates regarding the best management of aortic disease. The general considerations regarding the benefits and drawbacks of CG presented above are applicable for the joint document on thoracic aortic diseases (Table 4). For instance, the American guidelines on valvular heart disease were composed by only 12 members and the European guidelines on aortic disease by 20 members, only 5 of whom were surgeons [16,17]. Taking this into consideration, is evident that these CGs can be considered to have resulted from an unbalanced working group, especially from a multidisciplinary point of view. Currently, CGs on thoracic aortic diseases are still debated in the management of acute and chronic pathologies. In acute aortic syndrome (AAS), pathologies involving the ascending aorta, such as acute type A dissection or intramural hematoma, require urgent surgery of the ascending aorta (and possibly the aortic root) and partial arch replacement (IB) . However, the management of the aortic arch in this pathology is still under debate; no complete consensus yet exists in the cardiothoracic surgery community regarding the best management of the aortic arch in AAS. Some surgeons advocate a more conservative tear-oriented approach (hemiarch replacement) to reduce postoperative mortality and morbidity . However, other authors support a more aggressive approach for AAS, mainly consisting of total arch replacement with or without the use of the frozen elephant trunk or classic elephant trunk technique [19–22]. Moreover, a distal arch entry site, enlargement of the aortic arch, and true lumen compression are still not discussed in the CG as clear indications for surgery of the aortic arch in AAS, which may be considered a deficency. Organ malperfusion is the only condition where consensus exists regarding arch threatment or the use of hybrid procedures (level of reccomendation IIA). In chronic aortic pathology, more controversies and conflicts exist among the current CGs. For instance, the recent ACC/AHA CG for the management of valvular heart disease contain a class 1 (level of evidence B) recommendation for operative repair of a dilated ascending aorta of 5.5 cm or greater if associated with a bicuspid aortic valve . In contrast, in 2010, the ACC/AHA joint CG for thoracic aortic disease recommended elective aortic repair for patients with bicuspid aortic valve when the diameter of the aorta is between 4.0 and 5.0 cm (class 1, level of evidence C) . In 2016, to clarify those controversies, the same societies published a clarification statement entitled “Surgery for aortic dilatation in patients with bicuspid aortic valves” as an addendum to both the valvular and thoracic aortic CGs . Similar limitations are also evident in the latest European CG on the diagnosis and treatment of aortic diseases where not even a single class of recommendation was supported by evidence of level A or B . Such controversies in CGs still exist due to the unpredictability of aortic rupture, which is predicted only using the diameter of the aortic aneurysm (Fig. 2). Indeed, it is impossible to know the dimensions of all individuals with aortic aneurysmal disease, and it is also the case that a large number of patients who experience aortic dissection have an aortic diameter less then 55 mm. The International Registry of Acute Aortic Dissection enrolls patients who have acute aortic dissection and has demonstrated that dissection can occur at aortic diameters below the traditional threshold of 5.5 cm . The challenge, however, is that we cannot calculate the risk for dissection according to the aortic diameter. We know that other risk factors for aortic dissection could be involved in the pathogenesis, and also know that other potential unknown factors are involved too, but they cannot be considered in the CGs . The challenge in everyday clinical practice is to analyze individual patient characteristics along with the aortic diameter (as stated in the CGs) prior to making the final judgment on surgical or conservative interventions. We hope that this document will stimulate further discussion and research, especially with regard to designing and conducting randomized trials that move the field forward, allowing the development of firmer recommendations. As a tool, CGs summarize the state of our knowledge regarding a group of individuals who share a particular characteristic or finding with the ultimate aim of assisting clinicians in selecting the best management strategy for the patients. The composition process of CGs is complex and has significant limitations, both procedural and relating to the available data. Our challenge as clinicians is to take care of the individuals who came to our attention. Efforts to improve the quality of care and outcomes of patients with thoracic aortic disease should focus on future research to overcome the current critical gaps in knowledge. Fig. 1. Objectives of guidelines, expert consensus documents, and registry data. Fig. 2. 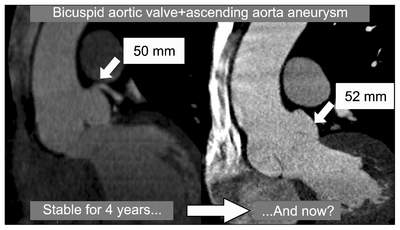 Five-year follow-up images of a patient with an aortic root aneurysm associated with a bicuspid aortic valve. Indications for intervention are based only on the diameter. Uncertainty exists in anticipating the risk of rupture or dissection. Lack of indications on when and how to replace the aortic arch.Organ malperfusion as an indication for arch/hybrid procedures has a level IIA reccomendation. Surgery is recommended for ascending aorta aneurysm associated with bicuspid aortic valve (currently for diameters ≥55 mm). Contraindications for surgical repair based on clinical parameters and patient conditions are not reported. Recommentations on intervention are based only on evidence of level C. Task force members are limited and often unbalanced in specialty groups (often in favor of cardiologists). Task force members are limited and often unbalanced in specialty groups (often in favor of cardiologists). Wasfy, JH, Armstrong, K, Milford, CE, and Sundt, TM (2015). Bicuspid aortic disease and decision making under uncertainty: the limitations of clinical guidelines. Int J Cardiol. 181, 169-71. Sellke, FW (2016). Finding the truth in the guidelines and gospels. J Thorac Cardiovasc Surg. 151, 1474-5. Shekelle, PG, Woolf, SH, Eccles, M, and Grimshaw, J (1999). 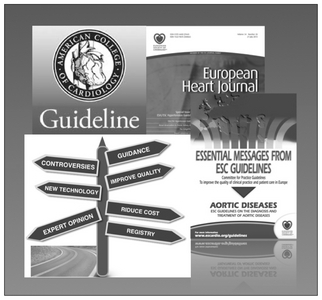 Clinical guidelines: developing guidelines. BMJ. 318, 593-6. Eccles, MP, Grimshaw, JM, Shekelle, P, Schunemann, HJ, and Woolf, S (2012). Developing clinical practice guidelines: target audiences, identifying topics for guidelines, guideline group composition and functioning and conflicts of interest. Implement Sci. 7, 60. Woolf, S, Schunemann, HJ, Eccles, MP, Grimshaw, JM, and Shekelle, P (2012). Developing clinical practice guidelines: types of evidence and outcomes; values and economics, synthesis, grading, and presentation and deriving recommendations. Implement Sci. 7, 61. Tricoci, P, Allen, JM, Kramer, JM, Califf, RM, and Smith, SC (2009). Scientific evidence underlying the ACC/AHA clinical practice guidelines. JAMA. 301, 831-41. Woolf, SH, Grol, R, Hutchinson, A, Eccles, M, and Grimshaw, J (1999). Clinical guidelines: potential benefits, limitations, and harms of clinical guidelines. BMJ. 318, 527-30. Shapiro, DW, Lasker, RD, Bindman, AB, and Lee, PR (1993). Containing costs while improving quality of care: the role of profiling and practice guidelines. Annu Rev Public Health. 14, 219-41. Kane, RL (1995). Creating practice guidelines: the dangers of over-reliance on expert judgment. J Law Med Ethics. 23, 62-4. Dreyer, NA, and Garner, S (2009). Registries for robust evidence. JAMA. 302, 790-1. Faxon, DP, and Burgess, A (2016). Cardiovascular registries: too much of good thing?. Circ Cardiovasc Interv. 9, e003866. Messenger, JC, Ho, KK, and Young, CH (2012). The National Cardiovascular Data Registry (NCDR) data quality brief: the NCDR data quality program in 2012. J Am Coll Cardiol. 60, 1484-8. Erbel, R, Aboyans, V, and Boileau, C (2014). 2014 ESC guidelines on the diagnosis and treatment of aortic diseases: document covering acute and chronic aortic diseases of the thoracic and abdominal aorta of the adult. The Task Force for the Diagnosis and Treatment of Aortic Diseases of the European Society of Cardiology (ESC). Eur Heart J. 35, 2873-926. Nishimura, RA, Otto, CM, and Bonow, RO (2014). 2014 AHA/ACC guideline for the management of patients with valvular heart disease: executive summary: a report of the American College of Cardiology/American Heart Association Task Force on Practice Guidelines. J Am Coll Cardiol. 63, 2438-88. Westaby, S, Saito, S, and Katsumata, T (2002). Acute type A dissection: conservative methods provide consistently low mortality. Ann Thorac Surg. 73, 707-13. Kazui, T, Washiyama, N, and Muhammad, BA (2000). Extended total arch replacement for acute type A aortic dissection: experience with seventy patients. J Thorac Cardiovasc Surg. 119, 558-65. Urbanski, PP, Siebel, A, Zacher, M, and Hacker, RW (2003). Is extended aortic replacement in acute type A dissection justifiable?. Ann Thorac Surg. 75, 525-9. Shrestha, M, Fleissner, F, and Ius, F (2015). Total aortic arch replacement with frozen elephant trunk in acute type A aortic dissections: are we pushing the limits too far?. Eur J Cardiothorac Surg. 47, 361-6. Di Eusanio, M, Castrovinci, S, and Tian, DH (2014). Antegrade stenting of the descending thoracic aorta during DeBakey type 1 acute aortic dissection repair. Eur J Cardiothorac Surg. 45, 967-75. Hiratzka, LF, Bakris, GL, and Beckman, JA (2010). 2010 ACCF/AHA/AATS/ACR/ASA/SCA/SCAI/SIR/STS/SVM guidelines for the diagnosis and management of patients with thoracic aortic disease: a report of the American College of Cardiology Foundation/American Heart Association Task Force on Practice Guidelines, American Association for Thoracic Surgery, American College of Radiology, American Stroke Association, Society of Cardiovascular Anesthesiologists, Society for Cardiovascular Angiography and Interventions, Society of Interventional Radiology, Society of Thoracic Surgeons, and Society for Vascular Medicine. J Am Coll Cardiol. 55, e27-e129. Hiratzka, LF, Creager, MA, and 2010 ACCF/AHA/AATS/ACR/ASA/SCA/SCAI/SIR/STS/SVM Guidelines for the Diagnosis and Management of Patients With Thoracic Aortic Disease Representative Members (2016). Surgery for aortic dilatation in patients with bicuspid aortic valves: a statement of clarification from the American College of Cardiology/American Heart Association Task Force on Clinical Practice Guidelines. J Thorac Cardiovasc Surg. 151, 959-66. Pape, LA, Tsai, TT, and Isselbacher, EM (2007). Aortic diameter >or = 5.5 cm is not a good predictor of type A aortic dissection: observations from the International Registry of Acute Aortic Dissection (IRAD). Circulation. 116, 1120-7.